Steve spent a week or so researching tractors, and asking those who know all about them, trying to figure out which kind, size, and brand might be more ideal for us. There are apparently all kinds that serve various purposes. But what kind was best for us? Can you say “daunting”? It’s overwhelming and intimidating enough to buy a car or major appliance. And we know enough about those to make a reasonably good decision. But a tractor??? What next? An airplane??! (of course, with our life, you never know!). Steve spoke with the seller on the phone, and then in person. The seller was going through a very hard time in his life. The information he told Steve about his circumstances is private, but was enough to show both Steve and him that this transaction and their meeting was bigger than just buying a tractor. In getting further acquainted, Steve was fully convinced…as was the man…that this transaction was God-guided, for both of them. We met with him a few days later. God was, unexpectedly, the center of our conversation for much of our visit. While Steve loaded up the tractor, the man and I talked about how the Lord has guided each of us in the past, and how badly he was in need of this encouraging conversation and time with us. He was going through a very difficult, sad, and scary crossroads. In the end, we were honored to pray over him, asking God to bless and protect him, and guide his new future to the most ideal one for him. What began as a need to simply buy a tractor ended up being the start of a potentially new friendship, a new beginning for the man, and a renewed appreciation and even more magnified awareness of God’s presence in his life, at a time when he needed it most. The tractor was just the bait to get fellow Jesus-lovers out to his side to comfort and encourage him, and pray with him. It was just another God-wink for us that we are still moving in the right direction. 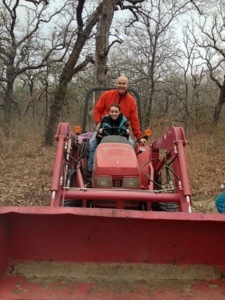 With tractor now in hand, we had work to do! 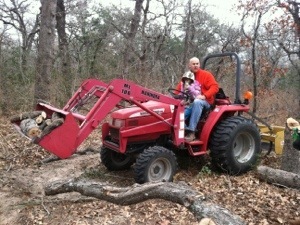 We had to prepare enough land for 80 logs to lay and be peeled, and had to clear the area where the house would sit. 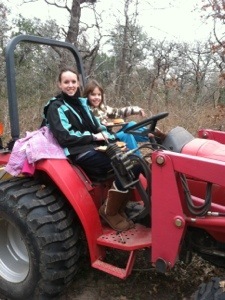 Steve got right to work…putting his girls behind the wheel. Further evidence of this morphing is their newfound enjoyment of utilizing downtime to shoot targets with bows and arrows and .22 guns. (Ok…I have to confess…I do the same things. I am the example they are following. Is that a good thing? Yikes.) Did I mention that they also love camo? 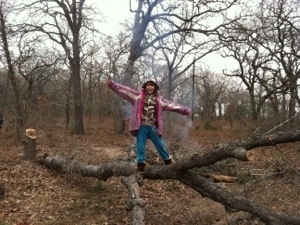 See what a little country air and surroundings do to city-folk? Beware! 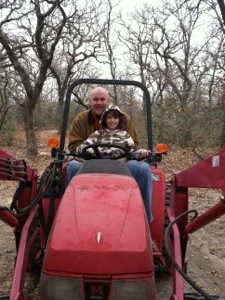 Below, the area behind the tractor was tall grasses and bushes. He used the tractor to scrape it all clean and put into a burn pile. Now it looks like this. It is our log preparation area. But, after the house is built, it will become an additional tank (small pond) for fish in front of the house. Next up… driving back to Livingston to choose logs! “ROAD TRIP! !” just click on link. Or, go to “What do Vegas and logs have in common?” to start from the very beginning of our log home building process. 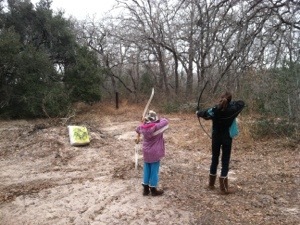 Or, click on “What is Cottonwood Creek?” to find out what this whole blog is about. Or, click on “Welcome to Cottonwood Creek” to start this chronological story blog from the very beginning, when we bought the land and built a 130-year old Bed & Breakfast on it. Also visit Grettys Grapes and Grains for personal stories from my life. Posted in christianity, construction, faith, family, inspirational, jesus, log cabin, log home, log home building, log house, UncategorizedTagged log home, new wheels, tractorBookmark the permalink.